If you’re a mobile developer, chances are you have your game on Android and iOS, and you never cared to port it to Windows Phone 8. Knowing the costs often involved in porting a game I can’t say I blame you for it, but I’d like to share my experience on what I think might be thes best place to put your game if you are a small independent developer that doesn’t have money to spend on marketing to compete with the big publishers. I’ll get into the details of why I chose to make a game for WP8, what the download numbers were for the three platforms and how much money I made on each. I also talk about how I marketed the game and why I think the game ended up being way more successful on the arguably smaller platform. Download links for the game can be found here. 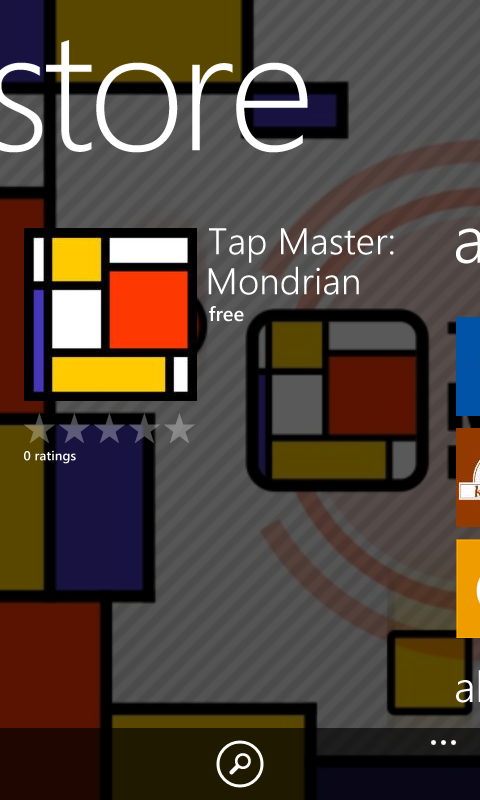 When I started to make Tap Master Mondrian, the first game I was making independently with the help of my friend who’s an artist, I needed a device to test the game. Being an iPhone user who only has a windows PC (Macs are really expensive here in south america, also video games) my choices were either buy an Android or a Windows Phone. To be honest, it wasn’t until I started researching the prices of android phones that the WP8 became a real option, because of all the reasons everybody knows: nobody has WP8, it doesn’t have any apps, yada-yada-yada. I was never a big fan of Android phones in the first place, but what I noticed was that for the small amount of money I was willing to spend I would get a phone that was completely garbage. Around the same time a friend of mine bought a mid range WP8 and paid a very good price, so I did a little research and found what I was looking for: a Lumia 520, a phone with decent specs for a ridiculously low price. Since Unity had recently added support for WP8, I had everything I needed. You might argue I would be better off spending a little bit more and buying Android, since the market is so much bigger, but one argument that helped with my decision was that everyone said WP8 did not have many games, so I thought that maybe that would be a good thing for the visibility of my game, which I knew from my previous job was a problem on the other platforms. And hell, I’m optimist and I like windows, so why not give it a chance? I don’t want to get into too much detail on the game itself, so I’ll try to be brief. The game is called Tap Master Mondrian and it’s pretty simple, I tried to keep the scope small enough, since I would be doing all the programming, design and marketing. My partner made the art and came up with all the visual identity (he’s also the reason why the game has ‘Mondrian’ on the name), and a friend of his made the music and sounds. 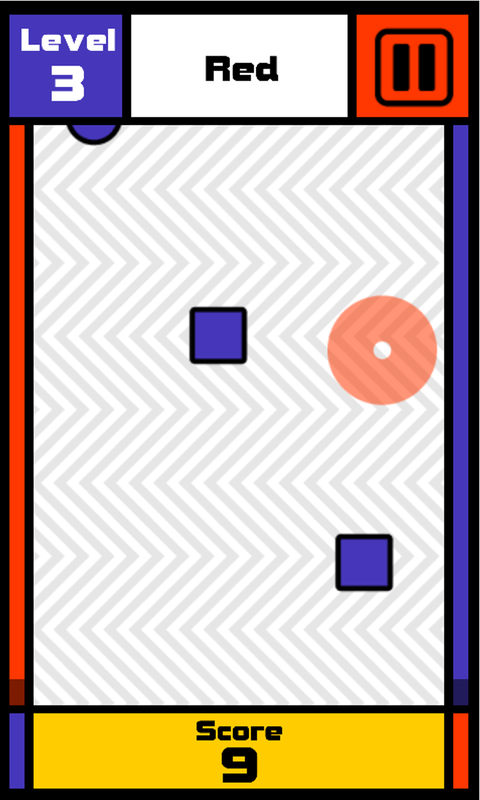 The gameplay is a basic “follow the rule” type, the player has to tap only the color or shape that is dictated on the top as the pieces fall down the screen. The speed increases as the player hits more pieces, and there are a few special effects that twist the gameplay from time to time. Pretty simple, but I wanted a project that I could complete, and I think it ended up being the right choice. Before I go into details of how I marketed the game I would like to share the overall download figures for the 3 platforms. The Android and WP8 versions were released at the same time, one year ago, and the iOS version was released almost two months later on. As of May 2015, numbers stand as shown below. The difference is absurd, and that is the reason I’m writing this article. I’m curious to know if other devs had a similar experience, because I certainly never heard about it, it’s usually the opposite. The game was released for free, and had ads and also a single IAP to remove the ads. I will get into the revenue and IAP numbers later on, first I would like to discuss the marketing strategy I used. That for me was one of the toughest parts of the whole process of making a game, how the hell do I get people to try it, or even know it exists? I read a bunch of material and tips, and ended up doing a lot of everybody suggests: a lot of social media, email all the websites, contact youtubers, posting on forums. As for paid advertising I tried two things, first admob, even though I heard it wasn’t very good. I did some banners and paid $40 dollars to admob to advertise my game (only the Android version), it resulted, according to admob, on 14 downloads, almost $3 per click. So yeah, stay away from this one. The second thing was facebook, I spent about $30, and it got me around 10 downloads a day for a few weeks, this only for the iOS version. The only version I did not spend any money to advertise was the windows phone 8 one. So how did it get way more downloads? Well, in the first few weeks I was getting around 60-70 downloads a day on WP8, and 10-20 on android, all from posting around on facebook, twitter, reddit and forums. One thing I did realize was that the windows phone users were much more interested and would engage more with my posts than the android users. So even though the android communities were much bigger, they mostly would not care or even see my posts, while the WP8 users were happy that a developer would value their platform of choice, and care enough to make a game for it (specially a game that wasn’t already on iOS). There were also a lot of enthusiastic users who would post about the game on their page, blog, youtube channel, show to friends at school, etc. 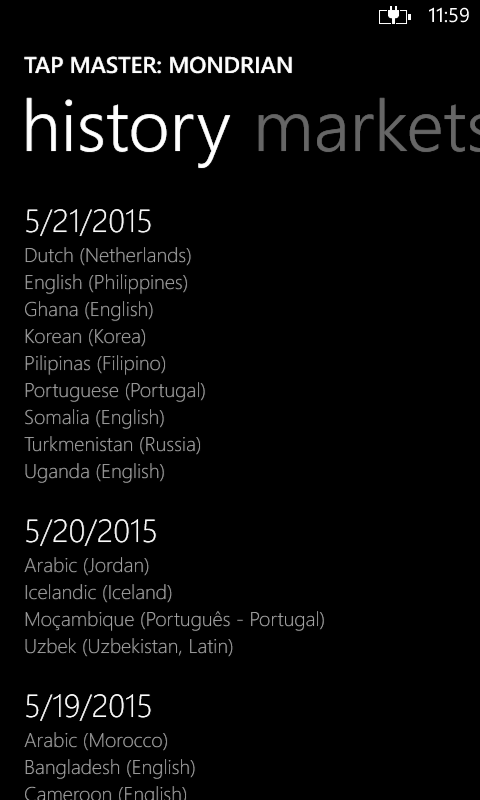 After two weeks I started seeing posts about the game on small pages, all dedicated to windows phone alone, most of them from Brazil (and this is where a little bit of luck comes in, since I’m brazilian and it is one of WP8’s biggest markets). 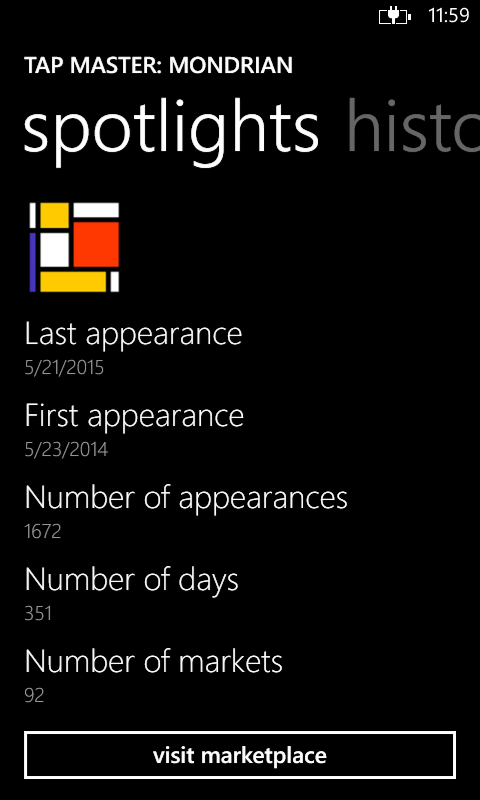 At this point I was getting around 150 downloads a day on WP8, and I was pretty happy about it, since the Android was steady on 10-15 daily despite my efforts, and no page or website had posted anything about the game. The big increase on downloads started on the following week when wpcentral (apparently now called windowscentral) made a post about the game. That day we had almost 900 downloads, and that made the game visible on the charts. On the following days a lot of others smaller sites posted about the game, and the daily numbers increased slightly, but then game the real game changer in the form of an email entitled “Your app will be featured on the windows phone 8 app store”. The feature was only for the brazilian store, which is the game had the highest number of downloads then, and even though I was pretty happy about it, I did not expect to get so many downloads, so I was really surprised when the game was downloaded more than 10 thousand times that day (a saturday, if I’m not mistaken), and a couple thousand more on the day after. The whole feature thing got me really excited because I knew it was something very hard to get on iOS and Android. But as much as I was excited, I thought that would be the end of it, that the lightning would not strike twice. Of course, I had no idea how microsoft treated features. A few days later, for my surprise, the game got another feature on the brazilian store, and also on a handful of smaller countries, that ended up meaning around 6 thousand downloads. So I started changing my phone store to see how the game would be featured, sometimes it would be on a huge spotlight on the front of the games section, while sometimes on a page almost hidden, but still better than no spotlight at all. 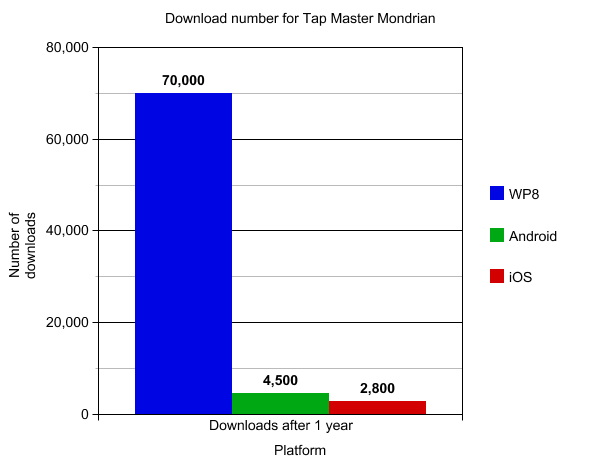 And the features kept on coming, keeping the download numbers on a steady growth, to this day one year after launch Tap Master Mondrian usually has around 100 downloads on a day, up to a couple thousand when featured. In April 2015, for instance, it was downloaded a total of 5888 times across the three platforms, from which 35 on iOS, 228 on Android and 5625 on WP8. So how much money 70k downloads get you? Not much, I’m afraid. If you’re a mobile developer you know this and also know that 70k downloads is not a big number. 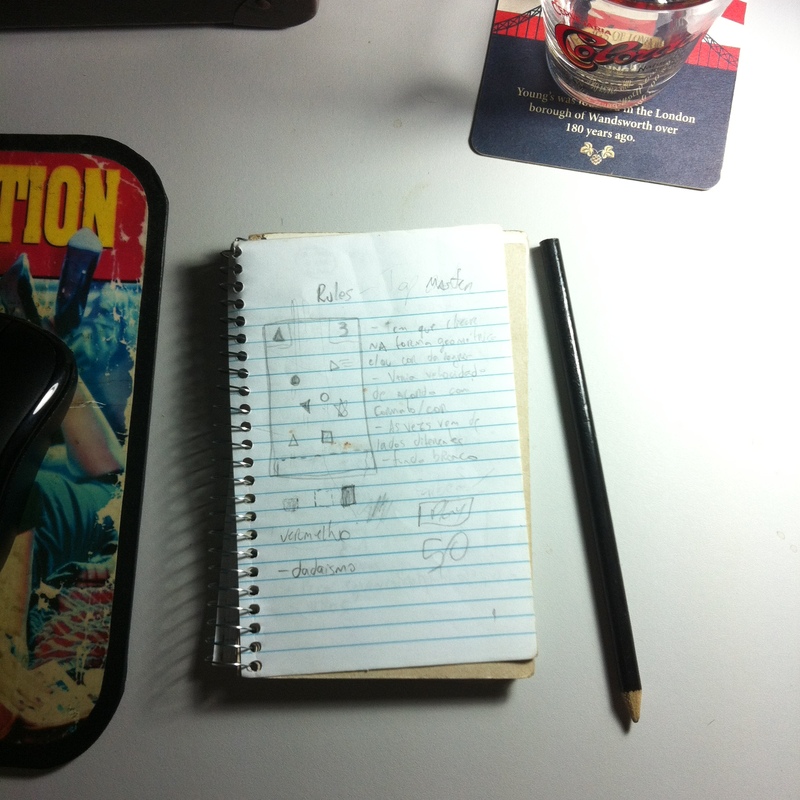 This is also the part where I admit I made some mistakes while monetizing the game. I did not want to make a game with an aggressive IAP model full of coins and lives, specially since video ads play a good part of that and there is no option for video ads on WP8 as far as I’m concerned. So I ended up deciding to go with admob banners and full screen interstitial. I tried not to be very annoying with the ads as well, there is a banner on the bottom that appears every other game, and the interstitial only appears when the player goes back to the main menu. Looking back now I think I may have gone too soft on the ads, or maybe I should have given more thought to the whole monetization thing and do lives with timer or something, because the financial side didn’t really work as well as I expected, the attach rate was low and very few people bought the “remove ads” IAP. The conversion rate did go up once I added a message asking for players to support the developers after they played a dozen matches. 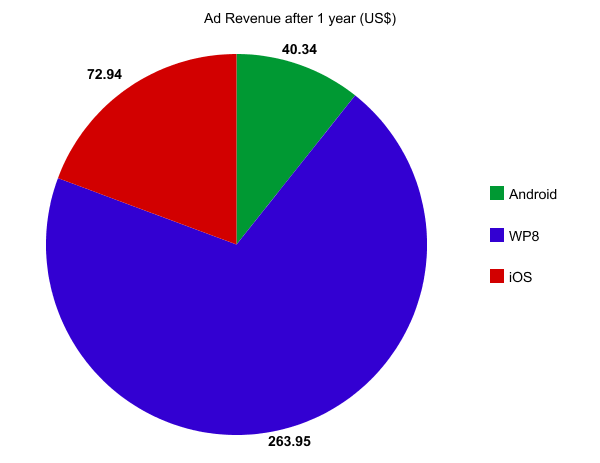 So the total Ad Revenue was $377,23, but even though the WP8 has the great majority of it, the CPM on the other platforms was higher, especially on iOS. It is common to see 1 click on iOS be worth the same as 15 clicks on WP8. I ended up going with admob because I wanted to concentrate all the money in one place, and it seemed like a good option. The fill rate has always been pretty good (almost 100%) across all platforms, except for the last month when it dropped to 10-20% on WP8, but google said it’s working to fix it. I also had an issue once where the ads stopped working on WP8 during one weekend, also google’s fault, and for coincidence it was the weekend I had the most traffic. As for the IAP, the numbers are so low that it’s not even worth it to make a graph, the % was pretty much the same across all the platforms, the totals being 55 for WP8, 4 for Android and 3 for iOS. That is pretty low, but if you play the game you will see the ads don’t bother you enough. Well, the main goal of this post was to show how windows phone can be a viable platform, mostly due to the feature system, that feels very fair to me compared to the ones on the Play Store and App Store, you feel like you have more of a chance for people to see yourgame. Even today, one year later, Tap Master continues to be featured almost on a daily basis, even though it’s mostly on smaller countries it does help to keep the number of downloads steady and way above the iOS and Android versions. I would love to hear the experience of other devs on windows phone 8, and I hope the information here can be useful in any form. If you have any question please feel free to comment on the post, on reddit, or ask me on twitter or via email, I’ll do my best to answer all of them. Tap Master Mondrian faz 1 ano! 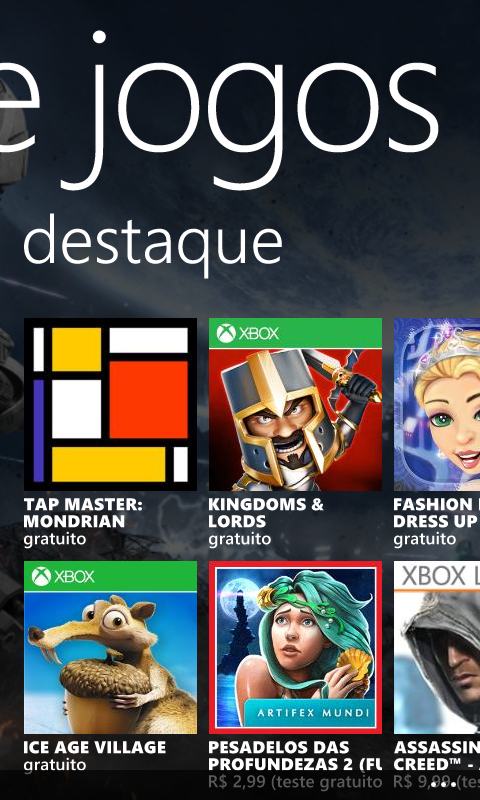 Em Maio de 2015 o Tap Master completa um ano desde o lançamento nas plataformas Windows Phone 8 e Android (iOS acabou saindo cerca de 1 mês e meio depois), e me parece ser uma boa oportunidade para falar um pouco mais sobre como foi o processo que levou à criação do jogo, como algumas decisões foram tomadas, e até mesmo por que fizemos esse jogo. Por que alguém faz um jogo, afinal de contas, ou um livro, ou um filme? Sem entrar muito no existencialismo da coisa, acho que o que eu tirei de mais valioso dessa experiência foi a importância de chegar ao final do processo que começa quando você tem uma idéia, conseguir concretizar e evoluir essa idéia de maneira realista e, mais importante ainda, concluir essa idéia. Ter uma idéia em sí é a parte mais fácil, mas não interessa quão genial ela seja, ela não vale nada se não for concretizada de alguma forma. Eu sempre tive dificuldade com isso, e por mais que o Tap Master seja um jogo simples, o sentimento de colocar uma idéia no papel e depois ver ela nos celulares de pessoas do mundo todo é algo incrível pra mim. Nesses 12 meses desde o lançamento, o Tap Master teve pouco mais de 70 mil downloads, o que no mercado mobile mundial não é um número muito expressivo, mas pra alguém que cresceu numa cidade de 24 mil habitantes, saber que 3 vezes esse número de pessoas ao redor do país e do mundo jogaram algo que eu fiz e que de alguma forma eu me comuniquei com essas pessoas que eu nunca vi e nunca vou conhecer, é algo que me deixa extremamente feliz e realizado. Nós estávamos trabalhando em outro jogo (ainda não finalizado) quando surgiu a idéia do Tap Master, e por mais clichê que possa soar, a idéia surgiu da necessidade de algo simples, tanto em conceito quanto em execução. Eu costumo jogar no celular só quando estou no ônibus, em alguma fila, ou esperando pra ser atendido em algum lugar, e acredito que esse seja o caso pra maioria das pessoas também. Um dia percebi que estava acumulando no celular vários jogos que pareciam incríveis, mas eu nunca jogava, como Sword & Sworcery, Silent Age e Max Payne. Por quê? Uma coisa que todos tinham em comum era que eles pareciam carecer de muito comprometimento e atenção, precisavam de duas mãos para jogar, tinham histórias elaboradas e em alguns casos tinham aqueles avisos pretensiosos que me mandam jogar com fone de ouvido para ter a experiência adequada. Então eu sempre acabava deixando eles pra uma outra hora, quando eu pudesse dar mais atenção pra eles (nunca, porque eu só jogo no celular nessas situações), e acabava jogando algo mais simples, que na época provavelmente era um joguinho excelente chamado Eighty-eight. Foi aí que percebi, pela própria prática como usuário, a importância de fazer um jogo que faça sentido na plataforma, e decidi tentar fazer algo que fosse específico pra mobile: partidas rápidas, conceito simples e intuitivo, e que possa ser jogado só com uma mão. Esses foram os pré-requisitos para o que veio a ser o Tap Master Mondrian. Como esse post já está meio longo vou deixar pra continuar na semana que vem, falando um pouco mais sobre o conceito do jogo e como o Alberto conseguiu transformar um protótipo feio em um video game com conceito artístico.